Sea Sickness – Controlling the body | Christian & Co. When the eyes perceive a different movement than the inner ear experiences the result can be sea sickness for a boater. While this is the common belief, the actual cause of sea sickness is not agreed upon by the medical community. Approximately 30% of the population is relatively immune to sea sickness while another 30% gets very little relief from common medications. The research supports my personal experiences with sea sickness. While I have been sea sick, and understand the feeling, it is rare for me but three of our family of five are prone to it. Research suggests anxiety about sea sickness contributes to its frequency and rest and hydration help prevent it. Eating lightly, including snacks such as ginger snaps and pretzels is preferred to not eating or to eating greasy or acidic foods. Wind across your face and staring at the horizon are proven to reduce discomfort and avoid others who are sick. Driving the vessel (and driving the car) is also helpful. Your senses tend to agree when you are in control of the boat and watching the seas. The back of smaller boats and amidships near the water line in ships generally has less movement. Staring at the horizon on deck is preferred to confusing your senses down below. An easy rule to remember is back of the boat and front of the plane. 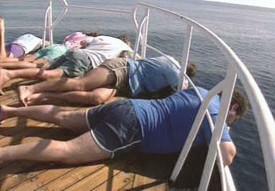 If one of the crew is sick, exercise caution if they are heaving over the side of the boat. Sea sickness is bad but a person overboard, particularly in heavy weather, is worse. 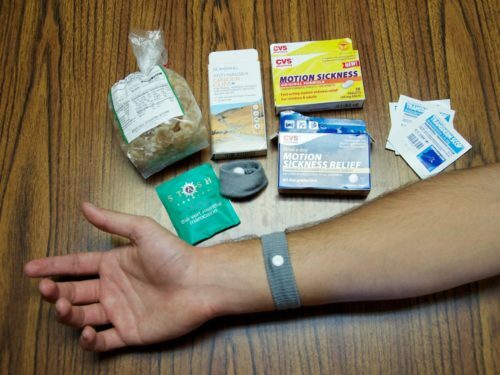 There are both homeopathic and “western medical” means for prevention and acute treatment of motion sickness. Homeopathic treatments generally have little to no side effects. Research indicates that some treatments are extremely effective on some people, thus trying various treatments is suggested. Unfortunately there are so many variables and unknowns in motion sickness, your personal research may take a long period of time and accurate record keeping to be effective. A common homeopathic treatment is acupressure or electro acupuncture on the T6 pressure point. This is the pressure point approximately two fingers up the forearm from the wrist. There are a multitude of wristbands and bracelets which apply pressure to this pressure point. There are electric wrist bands with variable intensity settings and both of these methods are effective on some. There is an extensive amount of medication available for sea sickness. Primarily anticholinergics and antihistamines are used. Scopolamine is usually applied as a patch behind the ear and it works as both prevention and treatment for sea sickness. Antihistamines such as Dramamine and Bonine are most effective as preventative medicines and need to be ingested one to two hours prior to departure. The common side effects include drowsiness and dry mouth. A non FDA approved medicine Cinnarizine (brand name Sturgeon) is mentioned in several studies and may be the most effective antihistamine with fewest side effects. NASA and the U.S. Navy use conditioning and de-sensitization to reduce motion sickness in astronauts and pilots. So get out there, boat more often, and stop worrying about getting sick.